On Tuesday morning, my order from IKEA came. Some new little bins for my stamps and that turquoise cart that everyone is getting. By 2:00 I was inspired to do a craft room overhaul, including taking one big bookshelf and one small bookshelf downstairs for Kate's American Girl 'apartment' (her dolls live pretty well, I tell you!). I brought in an old brown bookcase from the guest room, so a rethink was in order. By 3:00, my craft room literally looked like a bomb went off in it. (Should have taken a photo!) By 9:00 this morning, there was still significant work to do, and I made a trip to IKEA to get the rest of what I should have ordered. By 3:00 this afternoon, I just knew I wasn't going to be able to make a card for today's post. There were too many 'loose ends' (you know all that stuff that you don't really know what to do with, but you just can't seem to throw it out?). Then I decided to put the loose ends in a box to be dealt with later and sat down at my newly organized desk to see what would come to me. A couple of my rainbow cards were featured at Paper Crafters' Library earlier this week, so I guess rainbow was own my mind. I used paper scraps to create the rainbow behind the white panel. I cut the white panel measuring 4x5, knowing that when I used my curvy cutter (Creative Memories, discontinued, sorry) and placed the two panels where a 4x5.25 panel should be, I would have a .25" gap where the rainbow could peek through. My original plan (and first panel) was to have the sentiment along the bottom of the curve, but it looked wrong, so I cut my Papertrey stamp and stamped it to look like a smile. The rainbow colors that you chose are beautiful together. So totally creative and so totally Ardyth! 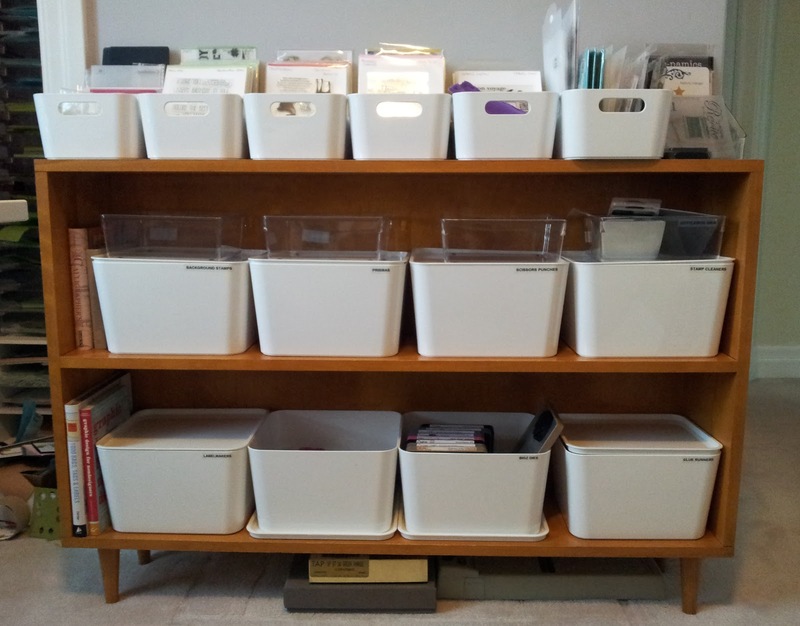 Love the neat & tidy bookcase (I'm definitely on the same page as you when it comes to being organized!) "A place for everything, and everything in its place"
Love your happy happy birthday card! Awesome use of scraps too - I thought it was patterned paper to begin with! And a lovely card as well! I absolutely love this gorgeous CAS card Ardyth and I'm amazed you could sit down and create it after the busy day you had - I'd have to lie down in a darkened room for a while after that lot!I love how your shelves look - so organised! That might be my favorite card ever.....so entirely Ardy! Do you use quill pieces when you put together a rainbow like that? Even my Genesis Trimmer couldn't make pieces that would fit together so perfectly. If I could make one sheet of that rainbow, using it would keep me busy for quite awhile, and oh the Ardy CASE cards I could make. LOVE your style! Love the rainbow stripes on the curve, and the curved sentiment looks great! My small craft room is just one long work in progress. As soon as I arrange things one way, I need to change them. Not settled in to it yet. But hey, it's not stopping me crafting! Gosh, I love this Ardyth! Love the "smiling" sentiment. I sure wish there was an IKEA close to me. Your new bins look so neat and tidy. Thanks for sharing. You have such a way with everything bright and graphic and perfectly placed. Love the rainbow curve. Now about that aqua cart? I guess I'll have to go see what you're talking about. Gorgeous Ardyth! I have lots of striped paper that I now have a plan for - thanks to you! Good for you for cleaning and organizing. Must feel very good. 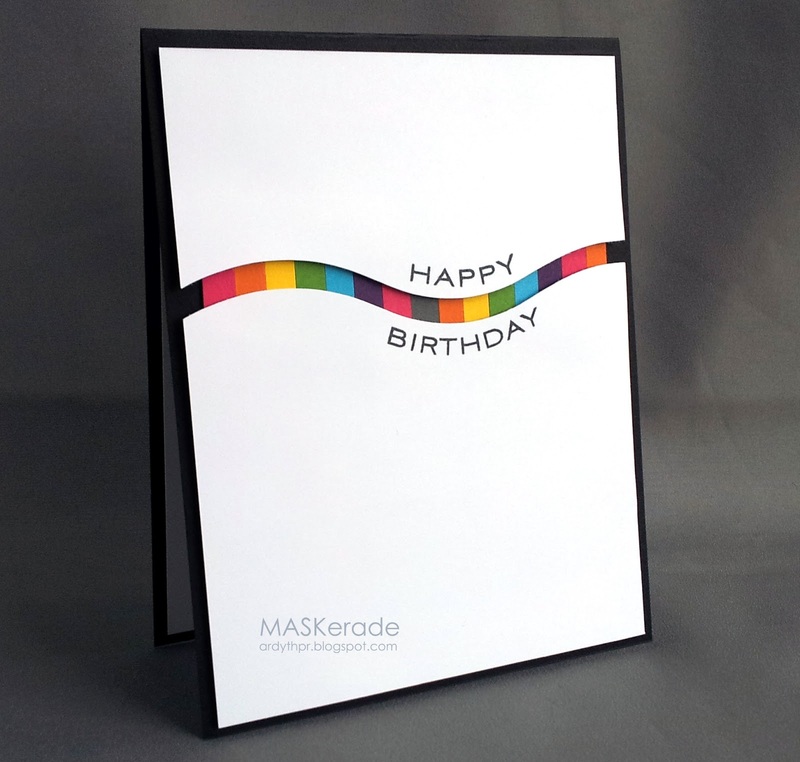 I love this rainbow card, and think it is such a clever design. I think I have one of those curvy cutter things from Creative Memories--good thing I don't get rid of stuff. I really love how you did the sentiment. Love this card Ardyth! Simple and effective - why are these "simple" ideas so hard to come by for me?? How about that turquoise cart - you are first to mention it for me. Can it rate a picture or where to find it? Awesome looking card - that pop of color looks fabulous~ Too fun with your shelf and bins... so nice to be organized isn't it? Love your curvy rainbow, and organized bookshelf. You have me curious about this turquoise cart, though. Haven't heard anything about that! This card simply makes me happy! I would like to use your card in a Trendy Tuesday feature. I will credit you with your work and link back to your site. Can you let me know if you DO NOT want to be included? What a great card Ardyth!! Will definitely have to 'case' this. Love the rainbow! !